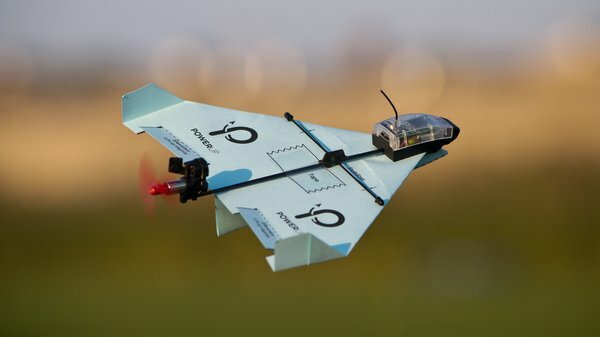 This latest model of this RC paper airplane is intended to bring aerobatic capabilities to the wildly-popular PowerUp fleet. 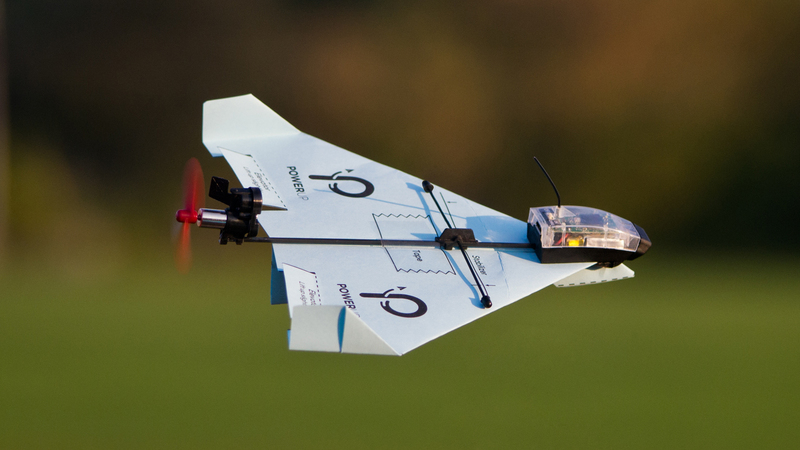 PowerUp Toys has been developing modules that clip on to paper airplanes to give them power and control. 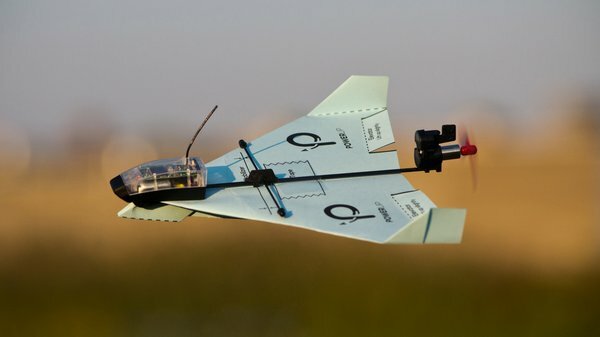 Yes, remote control paper airplanes. The Dart is their third variation on the theme. This latest model is intended to bring aerobatic capabilities to the wildly-popular PowerUp fleet. As I write this, we are two weeks into the Dart's 30-day Kickstarter campaign. 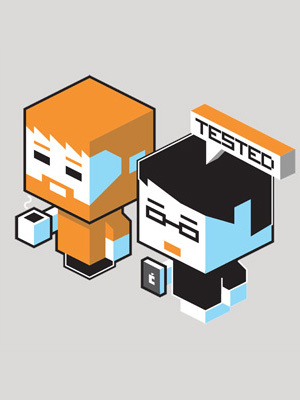 The project quickly met its $25,000 funding goal and additional support keeps coming in. That the campaign has already exceeded the initial target by more than $800,000 is a clear indication that people are excited about the Dart. I received a pre-production sample of the Dart for review. I'll reveal some of the technical details of this unit. Of course, I'll also tell you how it flies! PowerUp's previous model, the PowerUp FPV, utilizes two tiny electric motors and has an integrated camera for first-person-view flying. The Dart is considerably different. It more closely resembles the company's first RC offering, the PowerUp 3.0. That model has just one motor and no camera. The Dart and PowerUp 3.0 appear very similar, but there are a few significant differences that make the Dart a sportier flyer. Think of the Dart as the PowerUp 3.0 "Turbo". 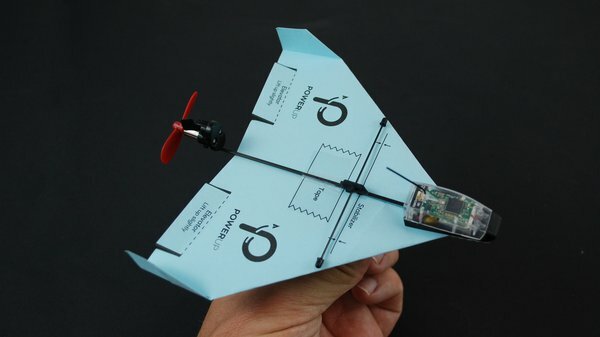 The PowerUp Dart is the third in a series of popular remote-controlled paper airplanes. The overall concept of the Dart is rather simple, even if the technology within is somewhat complex. The front of the clip-on module has a circuit board and tiny LiPo battery housed within a plastic case. At the rear, you will find a small electric motor with a propeller. 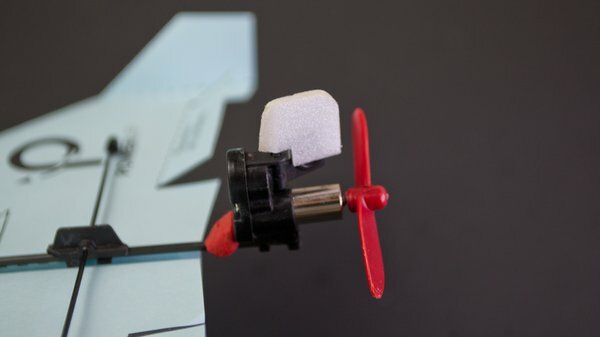 There is also a plastic rudder that is driven by a magnetic actuator. The front and rear components are rigidly linked with a square carbon fiber tube. The entire module is 155mm long (6.1") and weighs 9.5g (.3oz). 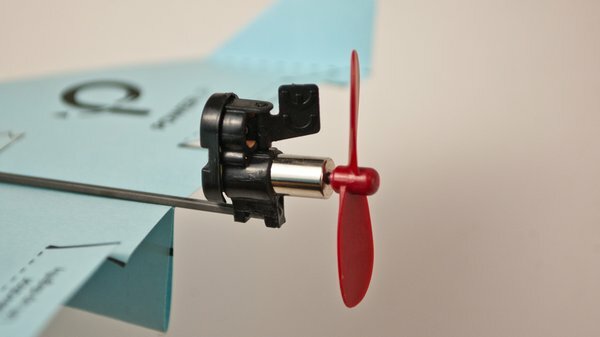 It attaches to the paper airframe with integrated clips and a single piece of tape. A wire antenna protruding from the front housing helps the device link to the pilot's smart phone via Bluetooth. 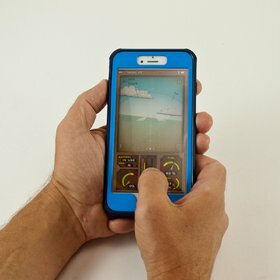 The pilot uses the PowerUp app to control the model by tilting the phone in the direction they want the airplane to turn. 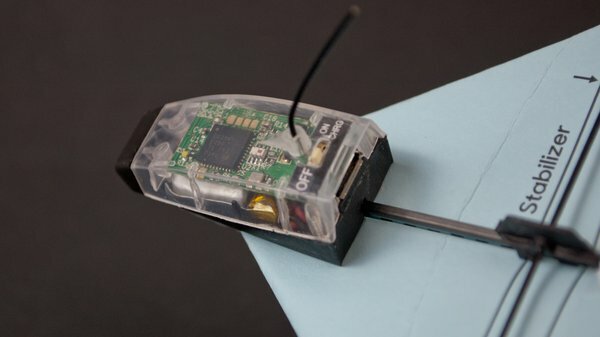 The nose of the Dart's clip-on module contains the necessary circuitry and a tiny LiPo battery. Looking at the differences between the Dart and PowerUp 3.0, the only obvious change is size. 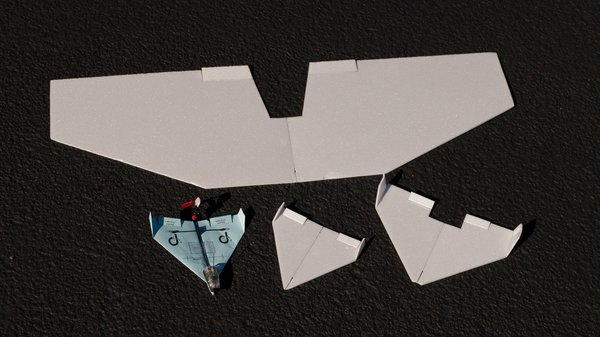 The Dart module is shorter and attaches to smaller, lighter paper models. Not so obvious is the Dart's more powerful motor and improved propeller. The end result is that a ready-to-fly Dart has a thrust-to-weight ratio of nearly 2-to-1 (double that of the PowerUp 3.0). That's good for aerobatic potential. Production versions of the Dart will also include simple removable landing gear. Pilots can choose to take off and land from smooth surfaces rather than hand launch and belly it in. My sample did not include the landing gear, so I was not able to test that option. It sure looks like fun though! A more powerful motor and improved propeller help make the Dart sportier than previous models. The module comes as a complete unit with no assembly required. Just charge the battery via the micro-USB port and it's good to go. A spare propeller is included as well. The airframe is another story. You have to fold that yourself. My sample included two preprinted templates for the Invader model. Others will be available to download and print. Better yet, create your own. There are a few prerequisites to flying the Dart. You need calm weather, with little or no wind. A sizeable field is also necessary. Something the size of a soccer field should do nicely. After a test glide confirmed that the model was relatively airworthy, I powered up the motor (there's a throttle slider on the app) and gave the plane a toss into the air. I suppose you're expecting to read that the Dart zoomed off and set the sky on fire. Um…no. In reality, the little paper flyer made it about 20 feet ahead before cartwheeling along the grass. That is to be expected. There are a lot of variables at play with a folded airplane. So some trimming and troubleshooting is normal. After some trimming and tweaking, I had my Dart flying well. It is the best-flying PowerUp model thus far. I spent several minutes tweaking the Dart. It seemed a little nose-heavy, so I gradually moved the crossbar (it keeps the wings from flexing upward too much) rearward. I eventually moved it as far as it could go without touching the elevators on the trailing edge of the wing. I also added a small dab of modeling clay in front of the motor for good measure. This got the balance point to a good spot. I had a more difficult time correcting the Dart's strong tendency to turn left. I believe this is caused by gyroscopic and torque byproducts of the spinning propeller, since the effect is more pronounced at high power settings. Adding greater reflex to the right elevator and adding right rudder trim helped considerably. The Dart is controlled with your smartphone via Bluetooth. I prefer to fly using two hands. Before long, I was able to keep the Dart aloft for sustained flights and make it fly in the general direction that I wanted. Having flown both the PowerUp 3.0 and PowerUp FPV, I am confident in saying that, once trimmed, the Dart is the most consistent flyer of the bunch. PowerUp claims that the Dart is capable of simple aerobatics such as loops, barrel rolls, wingovers, and more. It's important, however, to understand that this is a 2-channel model. This means that you can only command 2 control functions: throttle and yaw (rudder). Most aerobatic aircraft, whether RC or full-scale, use 4 independent controls: throttle, yaw, pitch, and roll. With the Dart, throttle inputs also influence pitch, and yaw has an ancillary effect on roll. So you are able to achieve variations of these aerobatic moves. You just have to sacrifice the precision that 4 separate channels provide. I've been able to perform several of the claimed maneuvers with my model. The only catch is that these moves are rarely intentional. Because the Dart is so small and zippy, quite a bit of twisting and turning is required just to keep it within visual and Bluetooth range. It can be tough to get straight and level long enough to set up for a trick. Most of my maneuvers are the result of going full power and turning in random directions. This style of flying is still lots of fun. There's never a dull moment. I expect that my maneuvers will become more deliberate with practice and familiarity. I'm used to flying models with a traditional RC transmitter, but I think that PowerUp's method is intuitive and easy to adapt to. In the past, I used an iPhone 5S and could fly with just one hand. I recently switched to a larger phone and found that I can no longer fly one-handed. I hold the phone in the palm of one hand and work the throttle with my opposite thumb. I've never flown an entire battery in a single flight. It is usually broken up over 3, 4, or a dozen shorter flights during a 20 minute period. The actual running time of the motor is somewhere around 10 minutes. So your actual flight time will vary accordingly. Recharging takes approximately 25 minutes. Crashes are going to happen. The Dart is so light, however, that damage to the module is unlikely. Consider the paper airframes sacrificial. They'll begin to get ragged and misshapen after a few good impacts with the turf. Always bring along a few pre-folded spares when you go flying. I think that a lot of people are drawn to PowerUp's models because of the novelty that they are made of paper. I get it. Who among us didn't make paper airplanes as a kid and imagine that we could control them? The reality is that paper isn't the best material for an RC airplane. Sure, paper is cheap, plentiful, and easy to work with. It just lacks consistency and resilience. The first time you land your Dart on a dew-soaked field, you'll see what I mean. I made three experimental airframes for the Dart module using sheet foam. Their performance varies wildly. When I tested the earlier PowerUp models, I found that airframes made of thin sheet foam are waterproof and essentially crash-proof. I've been using 2mm thick Depron foam. It's very similar to the foam used in meat packaging. I can whip up a foam airframe nearly as quickly and easily as I can fold paper versions. Best of all, I can experiment with my own designs without being limited to the angular lines of folded paper. The foam is considerably more resilient than paper, but none of my home-brew airframes fly as well as the stock paper model. So far, I have made 3 different foam airframes for the Dart module. One is a copy of the Invader. Another is about 50% larger. The final airframe I made is almost 10 times larger than the Invader. They all fly and each has very unique performance. The Invader knock-off is the best foam flyer, but it is still not as good as the paper Invader. That's just fine. I've been having lots of fun trying different things and observing the results. I have several more airframe designs in mind for the Dart module. Some will undoubtedly be flops, but I may stumble upon a gem! In addition to complete airframes, I also used 2mm Depron to modify the Dart's rudder. It is rather small and does not have much authority as slow speeds. I made a foam boot that slips over the rudder and triples its size. I had to be careful here. If I went too large, the magnetic actuator wouldn't have sufficient power to move the rudder during flight. I like the results, especially when flying the paper Invader. It is noticeably more responsive at slower speeds. I increased the Dart's yaw authority by increasing the rudder size with foam. I'm going to side with the thousands of Kickstarter backers regarding the PowerUp Dart. 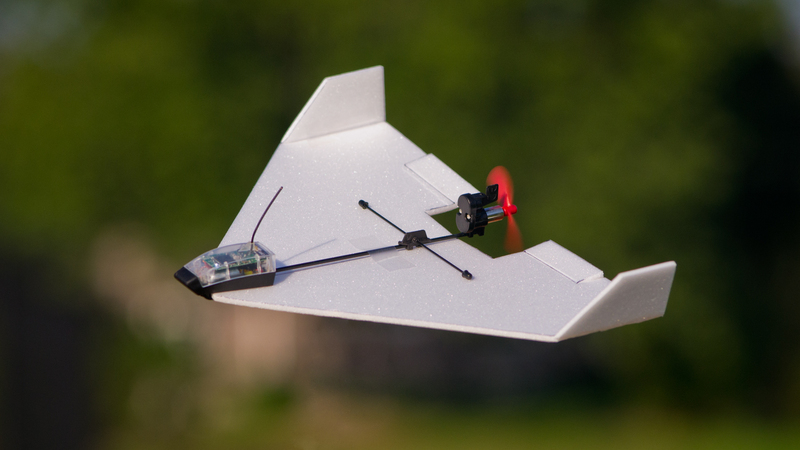 It's a good next step for an already-successful series of RC paper airplanes. In fact, I think it is the best-flying model in PowerUp's fleet. I'm sure that future Dart owners will be happy as long as they have realistic expectations. First of all, they'll probably need to make several adjustments before their model flies consistently. And if they're rookie pilots, there is a learning curve there too. Fold plenty of models! Lastly, the Dart is indeed capable of aerobatics. They just aren't very precise. The huge bonus on top of all that is the Dart module is a super platform for tinkerers to experiment with different aircraft designs. The Dart will be available in several packages. Retail prices start at $45. PowerUp has promised delivery by Christmas of this year.